All of the lattice beams in Philipp Manger's skateboard truck are less than 1 millimeter wide. Courtesy Philipp Manger. When it comes to skateboarding, flips and grabs are cool—but downhill longboarding is completely insane. Reaching speeds of more than 90 miles per hour, downhill longboarders combine skateboarding and surfing in an adrenaline blast that is all about speed. Clearly, keeping the wheels attached to the board is critical to these downhill daredevils. The “truck” of a skateboard is that piece on the underside of the deck that the wheels are attached to. 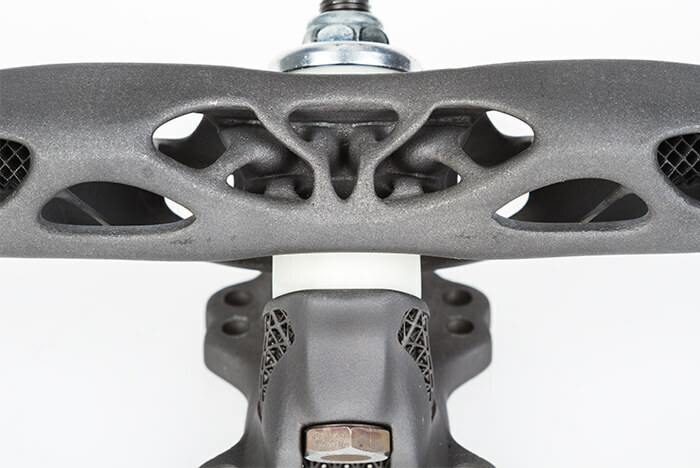 Made of axles, bushes, and pins, the truck is the interface between the wheels and deck that gives the rider the necessary control through shifts in weight, bending and reacting to the board’s travel. It’s a pretty important part, to say the least. 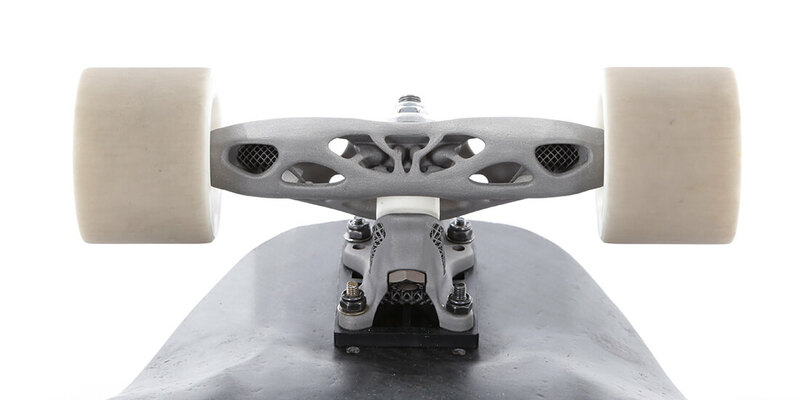 And now, like aircraft parts, furniture, and so many other modern objects, skateboard trucks are set to change, thanks to topology optimization and metal additive manufacturing. Topology optimization is an algorithmic process that reveals the most efficient design based on a set of constraints or characteristics, often by removing material from the design. 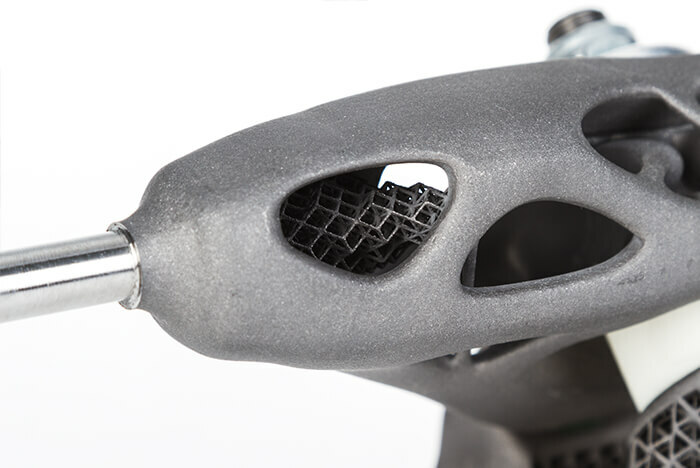 Philipp Manger used Autodesk Fusion 360 and Netfabb to aid his design optimizations. Courtesy Philipp Manger. 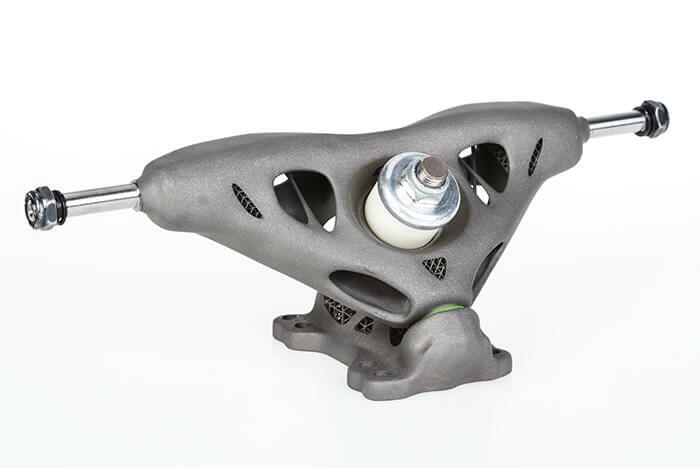 Project TOST (Topology Optimized Skateboard Truck) was impossible to make without metal additive manufacturing. Courtesy Philipp Manger. Philipp Manger began Project TOST at University of Applied Sciences Jena and manufactured it at Fraunhofer IWU. Courtesy Philipp Manger. 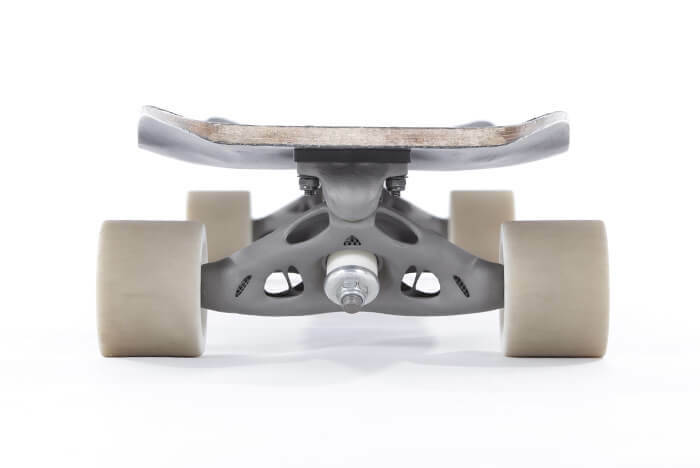 This topology-optimized skateboard truck is not commercially available—at least not yet. Courtesy Philipp Manger. Precision-engineering student and downhill skateboarder Philipp Manger applied his expertise to the skateboard truck because in his words, “It’s the only skateboard part I haven’t made before, and it fit perfectly to try out these new technologies.” But this venture, Project TOST (Topology Optimized Skateboard Trucks), specifically caters to downhill longboarding. Traditional skateboard-truck designs work for skating in the streets, but a style called the reverse-kingpin truck is better for longboarding and high-speed skateboarding. A native of Germany with more than 15 years’ experience in the engineering sector, Manger became a technical product designer, learning CAD and 3D design to work on—among many other projects—steering columns for the Mini Cooper. Get the software that streamlines Project TOST’s workflow. After leaving the automotive industry to study precision engineering at the University of Applied Sciences Jena in Germany, Manger “fell in love” with generative design, as well as other design-optimization techniques and additive manufacturing. When it came to redesigning the reverse-kingpin truck, Manger used Autodesk Fusion 360 and Netfabb to aid his optimization. Using Manger’s parameters and constraints for achieving the same (or higher) stiffness while reducing overall weight, the software output an optimized lattice structure. Lattice designs inspired by nature are intricate, bonelike constructions that look like they’ve evolved over millions of years. The improvements in weight, performance, and strength are a big deal in industries such as aerospace, but a skateboard isn’t that heavy—so what kind of performance does a topology-optimized skateboard truck offer? Downhill skater and precision-engineering student Philipp Manger approached Project TOST as a proof of concept, rather than a commercial enterprise. Courtesy Philipp Manger. “In terms of downhill skateboarding, if you try to brake from 80 kilometers per hour on a board weighing 5 kilograms, it’s harder than a board of 3 or 4 kilograms, so it makes the whole handling easier,” Manger says. But he’s also considering the whole experience, not just the fun part: Longboarders have to walk up long hills to skate down them, so any reduction in weight will also make the board easier to carry. Many parts designed using topology optimization like Manger’s truck are impossible to manufacture traditionally. Milling or casting techniques don’t have the finesse to remove material amid that tangle of detail. All of the lattice beams in Project TOST prototypes were less than a millimeter wide, which precluded those methods while also giving the project a quantum leap forward. “It was a goal to investigate the limit for metal additive manufacturing, the minimum feature size,” Manger says. As yet, Manger has no formal plans to commercialize the futuristic new skateboard truck. It’s not yet economically competitive with traditional truck manufacturing (Manger says it’d take a few more years to get there). Besides, the aim of Project TOST was always to enable a proof of concept. He says the project is bearing fruit because of the industry contacts, the companies seriously interested in the technology, the attention focused on the project, and the slew of awards he’s received at trade shows and conventions.